Today’s Joy Dare Challenge is to name three gifts of unframed art. 339. Mom’s Book. 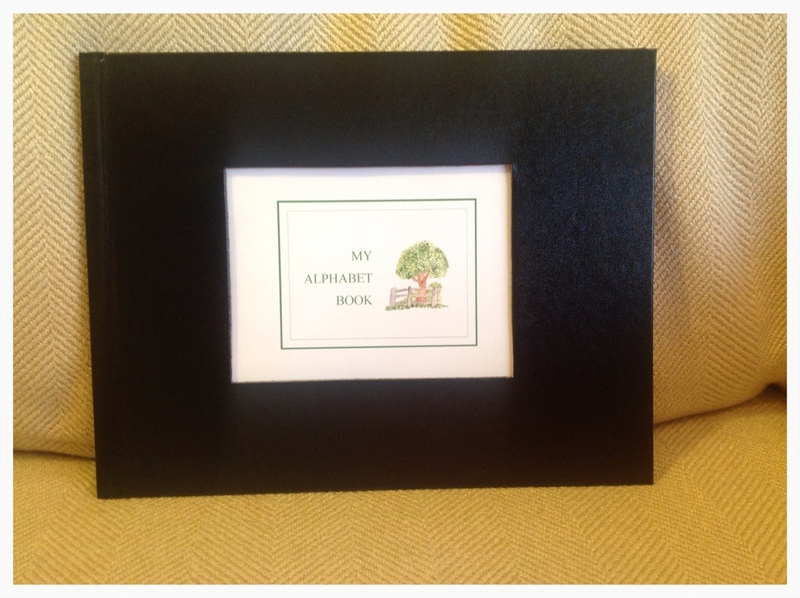 My 84 year old mother decided to create a personalized ABC book for her first great-grandson, Hudson. She began this project with doubts in her artistic abilities and doubts in actually turning it into a book. 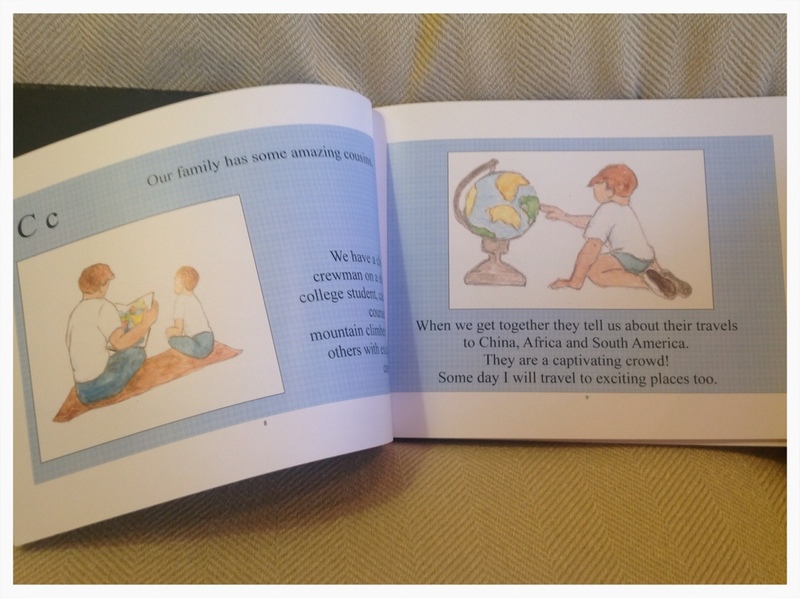 Each page was carefully written and hand drawn to showcase aspects of Hudson’s life. On this page “C” is for cousins who are a chef, a captain, college students and their trips to China and other places around the world. Of course I think this page describing “L” is pretty special. 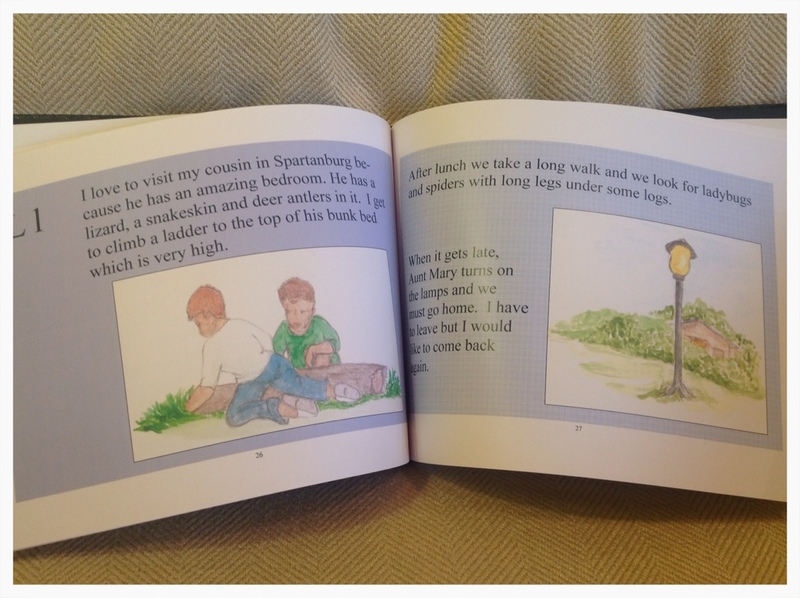 Hudson visits his cousin in Spartanburg who has a ladder on his bunk bed, a lizard in his room and where he takes long walks looking for ladybugs and spiders with long legs. This book is an absolute treasure. Now mom has to get started on the next editions for Parker, Aiden and baby Spencer! 440. Mary, Joseph and Baby Jesus. One of the very first Christmas decorations I made was this beanbag set of Mary, Joseph and Baby Jesus. I knew I wanted something that my future kids could hold and move around. It has held together for 26 years and hopefully for 26 more. 441. Kid made Christmas Ornaments. 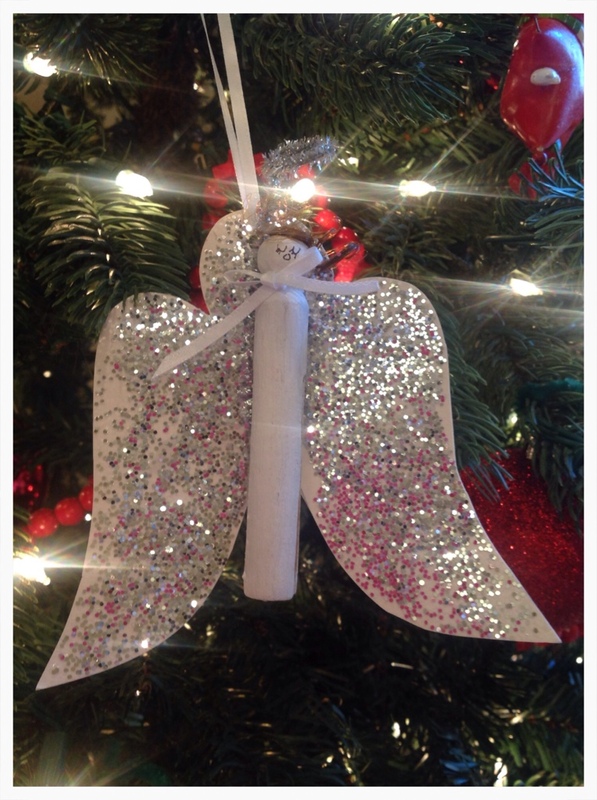 As I decorate my tree, my most precious ornaments are the ones my kids made when they were younger. Not only are they special because their little hands made them, but I am reminded of how blessed we were with the Godly teachers and administrators they had in their public school. 442. 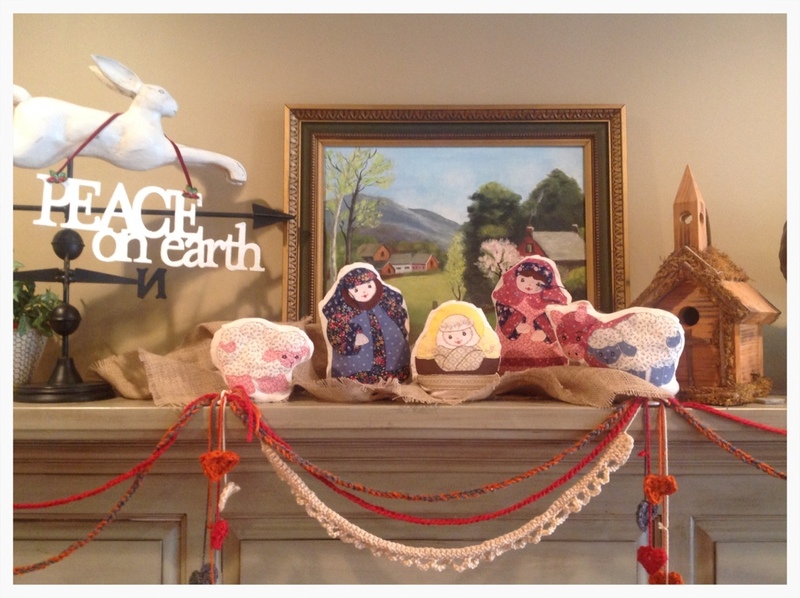 Nativity Banner. Santa came to our house when the kids were growing up. We wrote letters to Santa, set out cookies on Christmas Eve, and he left presents under the tree. But he wasn’t our main focus during the Christmas season, Jesus’ birth was. 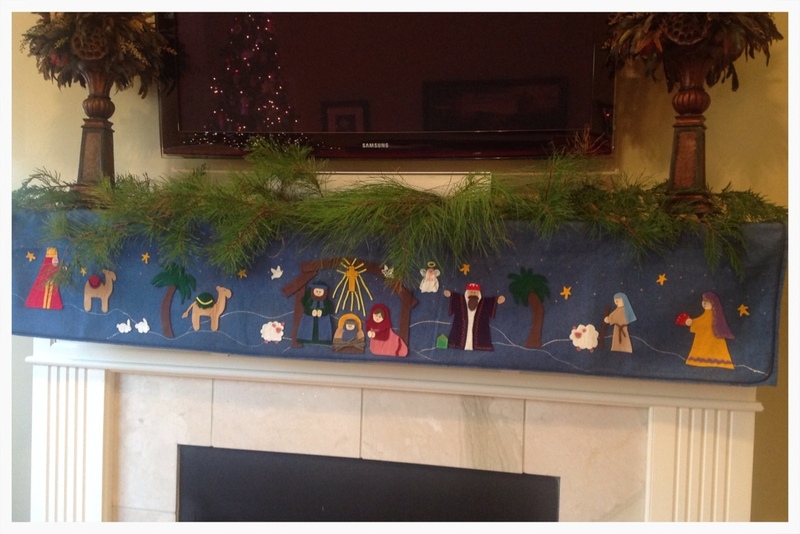 This nativity banner hung where we lived most in our home. Although it is made with simple felt and paint, as I cut and glued, I knew it meant more. 443. 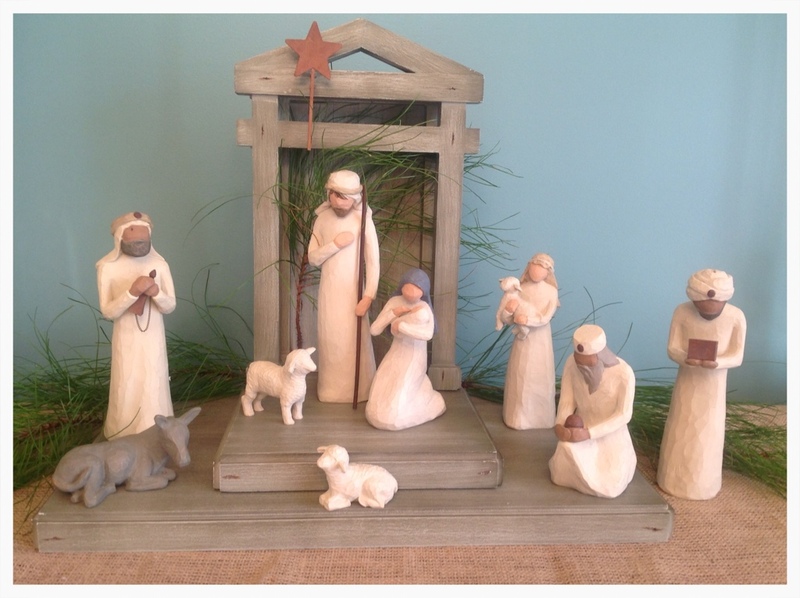 Handcrafted Nativity Scenes From Around the World. 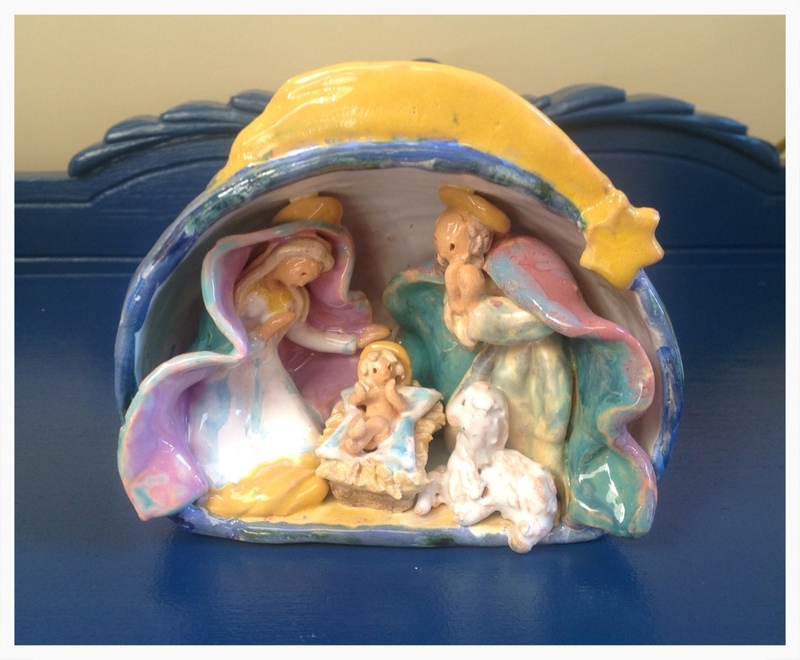 As we travel, I like to look for handmade nativity scenes to bring home. Like this one from Rome, they remind me of how encompassing God’s love is. Gods love is for everyone! You don’t have to belong to a certain denomination or do certain acts, He loves us all! 444. My Crèche. I love my simple Dademco Crèche. It is displayed in the “fanciest” room of our house. The dining room is where we use our finest dishes, use our best manners and share our favorite meal with honored guests. I think it is only fitting that this is where Mary, Joseph and Jesus need to be showcased. Again, I named more than three gifts. But once I got started thinking about unframed pieces of art, I couldn’t stop. I hope you don’t mind. What are your unframed gifts of art? I’d love for you to share them with me! November is the month of “No Shave”, (which I promise I won’t participate in…eww!) and giving thanks. As you know, I’m in the process of writing down 1000 Gifts, so it makes me happy to see my friends and family posting the things they are thankful for on social media sites every day this month. 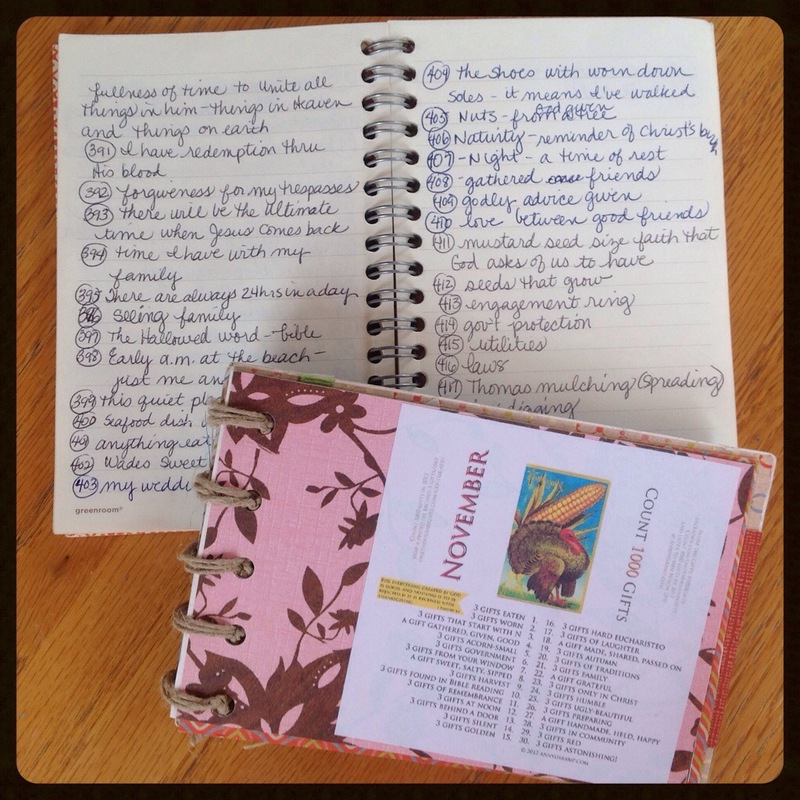 This is my calendar of daily prompts and the journal I write them in. Being a Domestic Godess/Jackie-of-all-trades/Diva of the Domicile/Domestic Engineer/Project Manager/CEO/Keeper of the Castle/Wonder Woman….or my favorite- Queen, I work hard at my job. The hundreds of tasks I do each day don’t require a masters degree, but each helps this home run pretty smoothly. I’m a simple gal. A little thank you goes a long way. Thank you for washing my clothes! I started thinking about other people I run into every day that are just doing their job. How would it make them feel if they were just thanked? Told how they were appreciated? 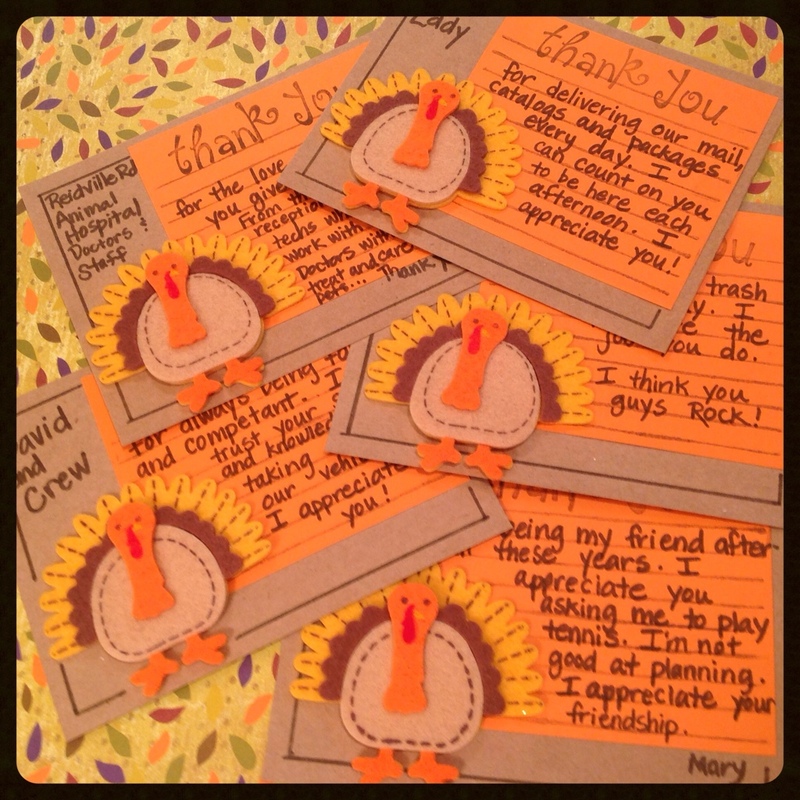 Sooo…I decided to make some quick and easy thank you cards to hand out this week. I thought about my mail carrier, garbage men, car repair guys, veterinary clinic, hair dresser and some friends. What about the cashier at the grocery store who’s line you get in because she’s quick? Your child’s teacher? Someone at church who volunteers their time to set up chairs or have the coffee ready or teaches Sunday school? I’m not going to make a big deal out of delivering the cards. In fact, I’ll probably just put it on the mailbox, garbage can or the door to the office. I just want to bring a smile to their face.